Since coming to Colombia I have been working on the government’s Colombia Bilingüe project. 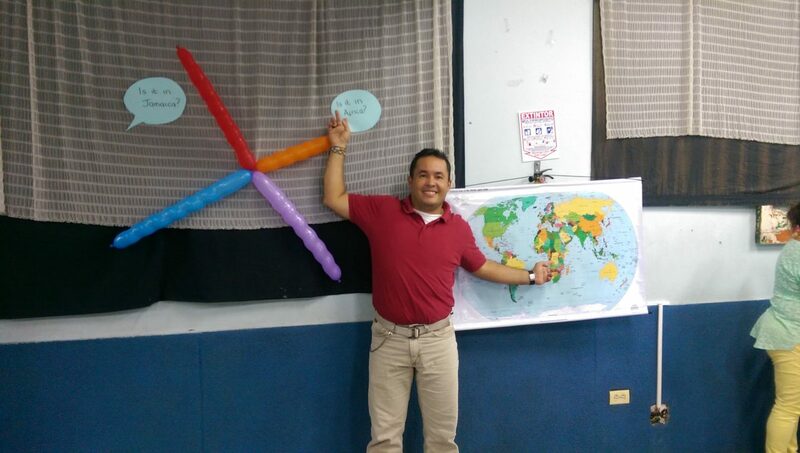 I have been a co-teacher at Institucion Educativa del Valle (also known as Politecnico) in Palmira, which is in the Valle del Cauca department, about 20 km from Cali. 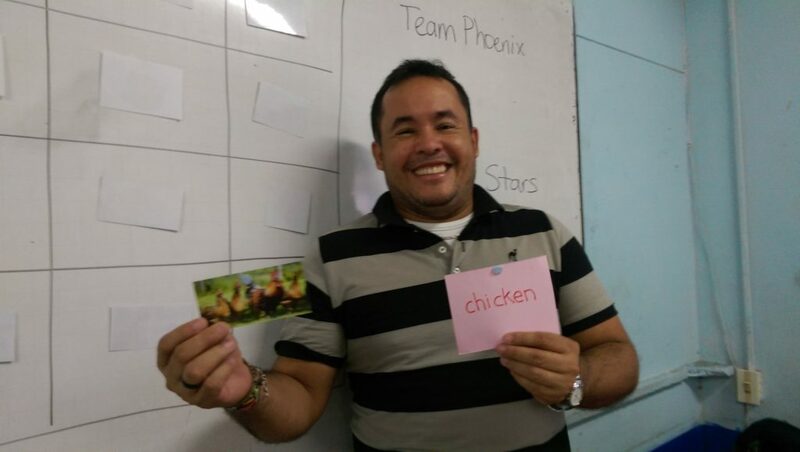 The system we work to is one where we always work alongside a Colombian co-teacher in the classroom. Our role is to be native speakers in the classroom, assist our co-teachers and help to develop lessons, especially ones that encourage the students to speak. I have more lessons with Alvaro than any other teacher. We mostly teach Year 9 students who are aged from 14 to 19 years old. He has been very keen to use the Colombia Bilingüe textbook as well as try out different teaching methods in the classroom. He speaks English in the staff room a lot and encourages his fellow teachers, in English and other subjects, to practise their English with him. I remember back in February, when me and Max started work, and Alvaro invited us to his home town of Candelaria for their annual fiesta of the Virgin. He welcomed us into his house, introduced us to his family and fed us a lovely (in my case vegetarian) meal. Me: What is your name and where are you from? Alvaro: My name is Alvaro Cely and I am from Candelaria, a beautiful little town in the south of the Valle del Cauca. Candelaria is surrounded by sugar cane and a lot of people work in agriculture. Me: How long have you been teaching for? Alvaro: For about 17 years and I have been teaching in this school for a year and a half. My subjects are Spanish and English. Me: What do you think is the best thing about working as a teacher in Colombia? Alvaro: I think that is helping my students to be better people. I think that teaching English helps them to have a better future and to have better opportunities in life. Me: And what is the hardest thing about working as a teacher in Colombia? Alvaro: I think the most difficult thing is the conditions that children are living in. I mean this in different contexts, so both their economic and social conditions. The situations that our students live in, they really are not the best. And the government does not do enough to support their education. Me: So, are you talking about the conditions in school or at home? Alvaro: I think it is both. Many of our students have parents who do not work and so they do not have much in their home. I think it is a shame, because our students, when they come from a home like this and they arrive in school to study, they are not able to do the best that they might be capable of. I think we need to start changing the conditions that our children are living in. Me: What has been your experience of working with Max and me? Alvaro: It has been good. I have learnt many things about you and your cultures. I think it has been a great learning experience. Me: And we have learnt a lot from you too Alvaro. Alvaro: Yes, I was very excited when you came. Because I am Colombian and I love my country and I wanted to show you the best of my country. What Alvaro doesn’t say here is that Candelaria is about 45 minutes away from school by bus and that he starts at 6.10am every morning. That is one crazy commute and demonstrates the commitment he has to his students. So, thank you Alvaro, for being so welcoming, for being so helpful and patient with me in the classroom and for showing me some of your beautiful country. It has been a pleasure working with you this year. Congratulations Alvaro!!! I remember you from the Diploma course. You were always eager to learn and you continue being such a nice person. Best wishes.